CAPE CANAVERAL, Florida -- An asteroid that is so large it has its own moon orbiting around it will come closest to the Earth on Friday, May 31, 2013. 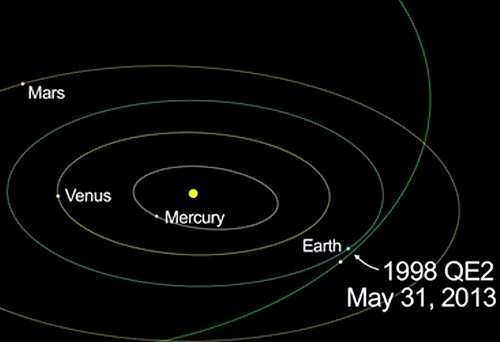 The closest approach of the 1.7 mile-wide asteroid named 1998 QE2 occurs on May 31 at 4:59 p.m. Eastern ( 1:59 p.m. Pacific / 20:59 UTC), when the asteroid will get no closer than about 3.6 million miles (5.8 million kilometers), or about 15 times the distance between Earth and the moon. This is the closest approach the asteroid will make to Earth for at least the next two centuries. A sequence of radar images of the asteroid were taken on Tuesday by NASA scientists using a 230-foot Deep Space Network antenna at Goldstone, Calif., when 1998 QE2 was about 3.75 million miles from Earth. 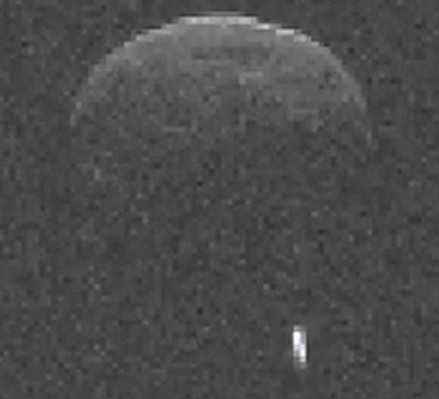 The radar imagery revealed that 1998 QE2 is a binary asteroid, meaning that it has a satellite or moon orbiting around it. NASA scientists estimate the size of the asteroid's moon, is approximately 2,000 feet wide or a little over 1/3 of a mile.